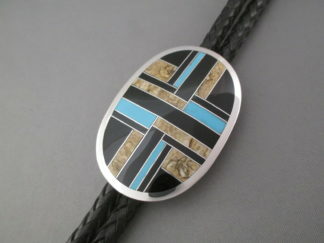 Gorgeous Sterling Silver Bolo Tie with finely inlaid Kingman Watermark Turquoise stones. Beautifully made by Native American (Navajo) jewelry artist, Charles Willie. Bolo comes with a 44″ braided black leather tie with sterling silver tips.